I have embarked on a project to republish the mainstay of my fiction work, all 6 volumes of THE BLOK SAGA, which began with the “Trilogy” – THE THERAPY OF AVRAM BLOK, CITY OF BLOK and THE LAST TRUMP OF AVRAM BLOK, and continued with THE DAYS OF MIRACLES AND WONDERS. These appeared between 1985 and 1997. 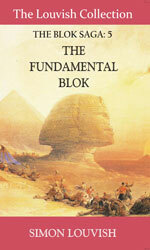 As the old anarchic anti-hero would not let go of me, I wrote a “final” – very long – fifth novel, THE FUNDAMENTAL BLOK, which scared the publishers half to death, apart from their apparent belief that as I had “rebranded” myself as a movie biography author I should content myself with that and get the hell out of their hair. This tended to make me even more stubborn, and a new thematic background, resulting from a series of trips to China and Mongolia beginning in 2005 led to yet another, even larger, Blok volume: BLOK 6: THE CHINESE SMILE. This only enraged the publishers even further. And so: I am printing the whole BLOK SAGA, under my own imprint of “Margaret Macdonald Books” (named after my wife’s mother, who passed away and is now my celestial publisher), including the two hitherto unpublished volumes 5 and 6, which are being printed in 2013. Apart from these books in “hard copy,” the Louvish Collection” will include E-book publications, in due course of the Blok books, E-book versions of previously published other fiction work (as digitalization allows), and other unpublished fiction, as other spin-offs of the major canon and a number of “light entertainment” books got written in the spasms between. E-book versions of the movie biographies themselves should follow, when and as they can be prized loose of their current mainstream publishers. Updates should appear in a timely fashion as far as technology and brain function allow. Please see contact page for further data.